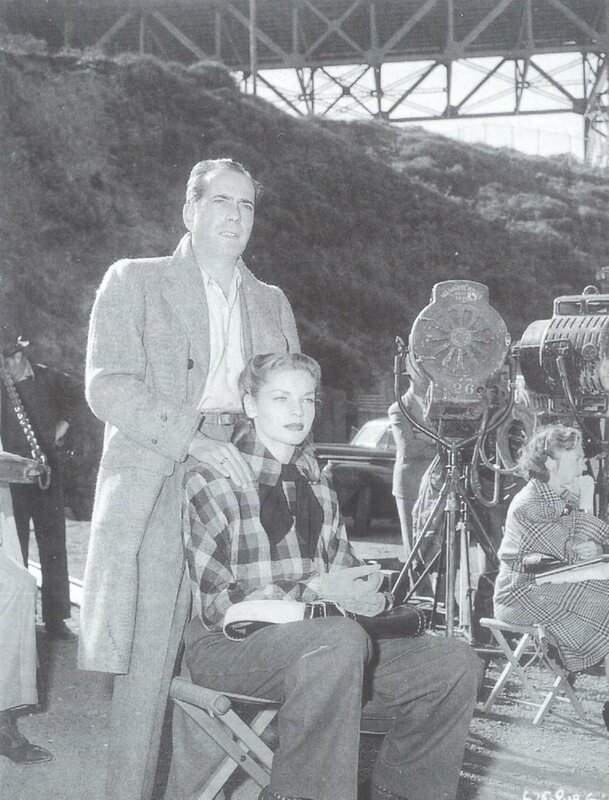 There’s something anti-Howard Hawks about the way Delmer Daves directs Dark Passage. No longer is Humphrey Bogart hit on by all the beautiful girls, nor does he get the last word (or punch) with a new line of antagonists. Were San Franciscans as hateful and petty as this in 1947? Bogart’s Vincent Parry is beset by people who talk too much, speak out of turn, and ask too many questions. Bus station attendants are surly and quarrelsome, the clerk behind a lunch counter shoots off his mouth and puts Bogie in dutch with a suspicious cop. 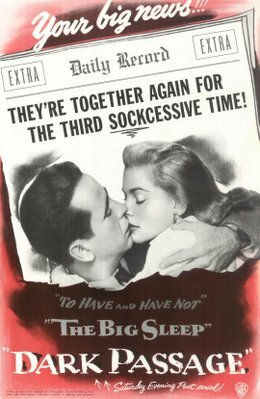 Little of this accommodates the Bogart/Bacall romance and action formula established by Hawks with To Have and Have Not and The Big Sleep. 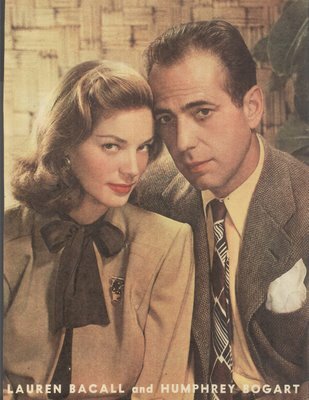 Suddenly, the glamour couple who always quipped above the fray is confronted with harsher reality of post-war noir, Bacall in particular seeming lost. Besieged with aggravations normally visited upon noir brethren Steve Brodie, Dana Andrews, or Farley Granger, the Bogarts' former luck prevailing over Hawksian opponents seems to run aground, and there’s only Dark Passage’s romantic fade to restore our confidence. To that point, there is Bogart as unrelieved born loser subject to frame-ups and blackmail. He’s actor enough to convey everyman despair, but his wife comes off ordinary and minimally competent now that Hawks’ protective aura has been removed. It is this level of uncertainty that makes Dark Passage compelling for me. Bogart’s post-surgical walk up endless stairs stays in the memory, as does the face procedure itself (I can make you look like a bulldog, or a monkey). Character vignettes abound. People like Tom D’Andrea, Bruce Bennett, Douglas Kennedy, and Clifton Young have nice turns in the spotlight, and Bogart is generous for throwing scenes their way. I’d not forgotten Young’s sneering villainy (he’s a would-be blackmailer driving the jalopy) since seeing Dark Passage the first time at fourteen. He actually reminded me then of eighth-graders at my school. Was that déjà vu that came of having seen him in Our Gang comedies where he played a character named "Bonedust"? I was intrigued to learn that the kid who brought a Minstrel and Blackface Joke-Book to the classroom in School’s Out was the selfsame Clifton (then Bobby) Young who would later bedevil Bogart. I wouldn't have expected him to turn up in a Republic Trucolor western from the (approximate) same period either, but there he is menacing Roy Rogers in Bells Of Coronado. There were multiple appearances in Joe McDoakes comedies as well. Turns out Young came to a tragic end when a cigarette caught his hotel bed on fire in 1951. Amazing how puzzle pieces come together with the help of imdb. Bogart’s hair was starting to fall out when he made Dark Passage. He had to take hormone injections to alleviate it. Bad nutrition and those twin excesses of alcohol and tobacco were blamed, but the star gave up neither. Three of the pictures just previous, Conflict, The Big Sleep, and The Two Mrs. Carrolls, had been shot, then shelved, for as much as two years prior to their release, so to a lot of his fans, Bogart suddenly looked older in Dark Passage. 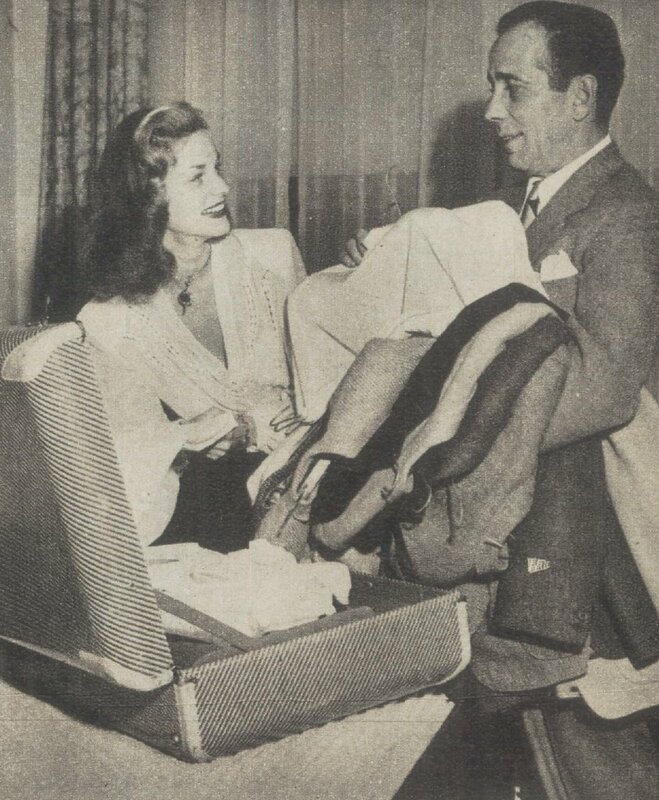 Most of the picture was shot on location in San Francisco, and as the Bogart’s off-screen relationship was now legally sanctioned by marriage, they were joined in their hotel suite by press profilers eager to observe, and photograph, their domestic habits. Bogart was riding higher at this point than ever before. Everything he did at Warners made money. Even one he deplored, Conflict, brought back a hatful of profit (two million, which equaled The Big Sleep). The new contract (67 pages long) called for a single picture each year at $200,000 per, plus one outside per annum. Monies earned in 1946 totaled $467,361. 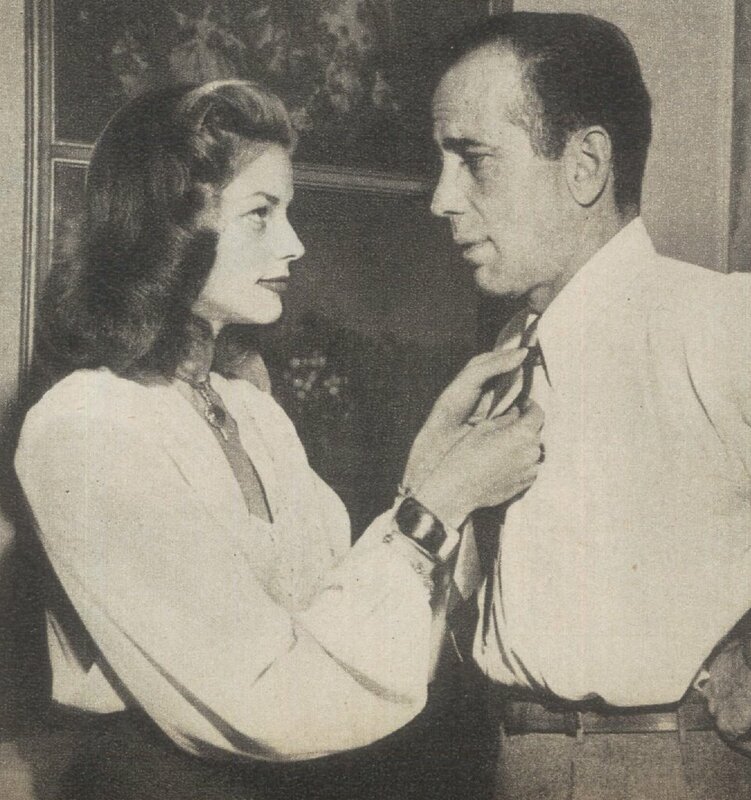 No wonder folks assumed Bogart left his family rich when he died in 1957, but according to later Bacall interviews, that wasn’t necessarily the case. Overhead then was as now. In Hollywood, it could be ruinous. Bogart had actually wanted to do Dark Passage. The source novel by David Goodis was a downbeat thing about dead end lives, and the central conceit of hiding the star’s face for the entire first half was tricky for customers expecting to look at the face they had paid to see. Was Bogart doubled during off camera and shadow shots? I think not, and for two reasons. One are the arms. You see those a lot when he’s reaching for blankets, taking straws from Bacall, and whatnot. They're Bogie’s alright, hands and arms hirsute and distinctive. Plus, I don’t think he’d have left his wife to mercy of stand-ins. 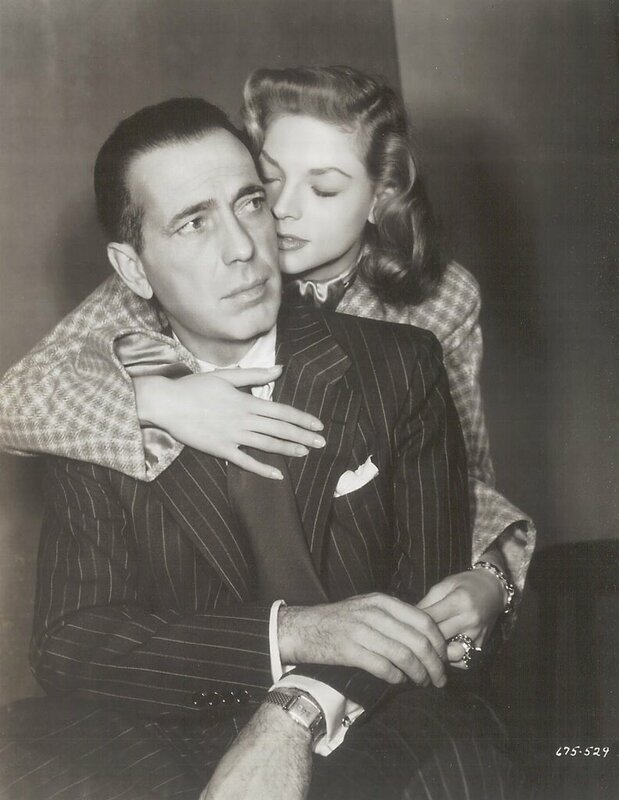 He would have wanted to protect her, and besides, Bacall needed all of help she could get. 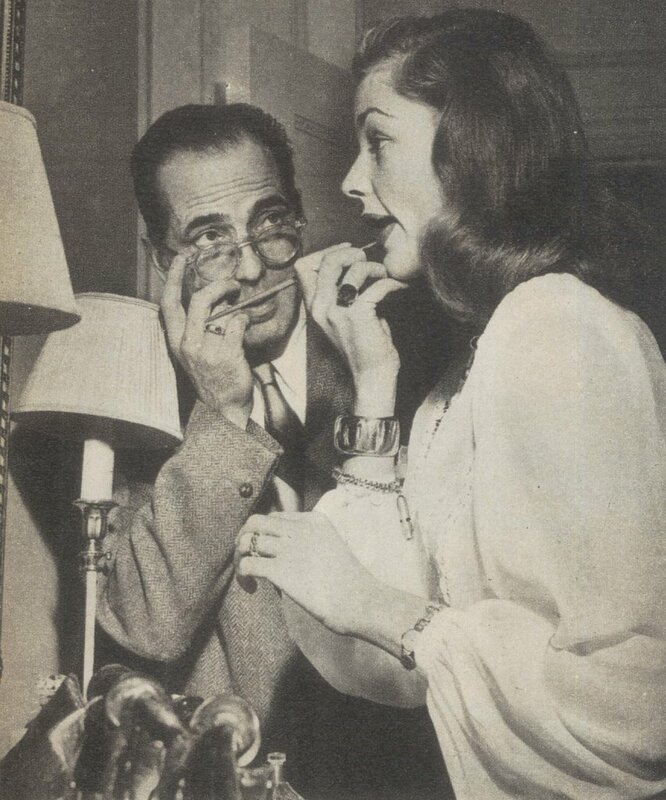 She would acknowledge later the at-home acting lessons Bogart gave her. Remember the scene in The Big Sleep where she’s cutting his ropes? Never was Bogart so solicitous of her. Much of that dialogue is ad-libbed. You can tell he’s afraid she’ll hurt herself. Watch your fingers. Don’t cut toward your hand. That must have been an anxious scene for Bogart to get through. A major Bogart career loss came with the death of producer Mark Hellinger. They had planned to get together on outside pictures the actor envisioned when he signing the new pact with Warners. Bogart admired writers, and Hellinger was a seasoned one. He had worked on newspapers and knew rhythm of the mean streets, coming to WB in the late thirties and earning Bogart’s respect by going to the mat with senior producer Hal Wallis, for whom he’d begun as an associate. Hellinger was also a world class drinker and raconteur, all of which further endeared him to the star. His talent lay in judging and packaging talent. Recently back from wartime service, Hellinger demonstrated an unerring eye for new kinds of crime stories that seemed all but revolutionary to post-war Hollywood. The Killers, Brute Force, and Naked City were essentially Warner thrillers taken to a new level of realism. Having produced several of the better Bogarts for Warners, They Drive By Night and High Sierra among them, he would now team with the actor for a series of independent productions. David O. Selznick came on board with partial financing. Bogart would also invest. Various banks agreed to furnish the balance. All these negotiations took place around the time of Dark Passage. Then Mark Hellinger collapsed with the sort heart attacks you get polishing off two quarts a day, and with him went the deals. I’ve often considered what direction Bogart’s future might have taken had the producer lived. We would have likely had vehicles of Naked City and Brute Force quality, rather than Tokyo Joe, Sirocco, and the rest we got. 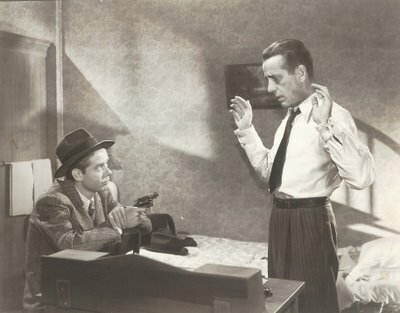 With Hellinger’s death, and Treasure Of The Sierra Madre and Key Largo behind him, Bogart went into a bad patch producing for himself with assist from substitute Warners veteran, Robert Lord, who had nowhere near Hellinger’s flair (only one of the Santanas, In A Lonely Place, was outstanding). There were but two more associations with John Huston, and none with Howard Hawks. Bogart was largely adrift in the fifties without collaborators worthy of him. Single projects for major directors like Billy Wilder and William Wyler provided little on which to build the sort of creative foundation he had developed with Huston and Hawks. A Bogart/Hellinger teaming might have led to a second wave of classics --- imagine the series of noirs these two might have produced. Fate deprived us of quite a banquet here. You could say Dark Passage was the last of the vintage Bogart pictures. Treasure Of The Sierra Madre would point more toward character leads, and Key Largo was loftier than what Huston and Bogart had earlier done (Across the Pacific, which I prefer). No more convicts nor dwellings in moral twilight for Bogart. Chain Lightning found him test-piloting in skies soon overpopulated with more conventional leading men, but what did Bogart have in common with William Holden, James Stewart, or John Wayne, and which branch of the service would be so remiss as to send a man of his years aloft? Of all his starring Warner vehicles, Chain Lightning may be the one least mentioned today. I’ve always liked The Enforcer, but he’s the establishment figure crusading against crime here, and would continue doing so in the following year’s (1952) Deadline USA. There was now no question as to which side of the law Bogart was on. To see him back in (escaped) prisoner attire was all the more surprising in late-in-the-day The Desperate Hours. These were my youthful introductions to Bogart, for they were sold among syndication packages otherwise salted with color titles to satisfy broadcaster’s demand for something other than stale pre-48 groups. Dark Passage came my way by virtue of a backwoods station from Asheville we could barely pick up that probably never heard of color TV. Remember watching movies on local channels? They’d cram features into ninety-minute time frames, then spend a third of that on commercials and "Dialing For Dollars" nonsense. It’s a wonder any of us developed an interest in this stuff, let alone maintained it through years of sustained abuse and neglect. I remember one UHF outpost out of Charlotte that simply switched off Treasure Of the Sierra Madre with ten minutes left to go, just so they could move on to an episode of Davey and Goliath. Basking in this era of TCM and DVD privilege, we forget how austere conditions once were. Many among us could fill a book with horror stories of wretched reception, relentless interruption, and jabbering hosts. On the subject of "jabbering hosts" and movie-interruptus, a b&w image flickered in my brain of an old round-screened Sylvania TV back in the early Sixties... Anybody out there remember "Cloudy" McClane, WBTV weatherman and host of THE BEST OF HOLLYWOOD on Monday nights on Channel 3 in Charlotte, NC? My mind may be playing tricks on me, but "Cloudy", a gaunt and fatherly presence on the show, may have replaced Allen Newcome, an equally gaunt and fatherly presence, when the latter passed away from what I believe was the result of complications from a WWII injury! (Correct me if I'm wrong.) Between commercials for Valleydale Sausage, Batter-whipped Sunbeam Bread, and Goodies Headache Powders, "The Best Of" showed mercilessly butchered prints of mostly feminine interest,i.e., MAGNIFICENT OBSESSION, THREE COINS IN THE FOUNTAIN, SO BIG, A MAN CALLED PETER, THE BOY WITH GREEN HAIR...and strangely enough, occasionally, KING KONG, which I'm sure must have somewhat distressed their target audience, the poor June Cleaver house-mommies who'd just settled down to relax, not prepared for crazed island natives with spears and sexually frustrated, barge-sized apes sans genitalia. Them was the days. Jeez, how many greats would've lived longer if they just laid off the booze and smokes? 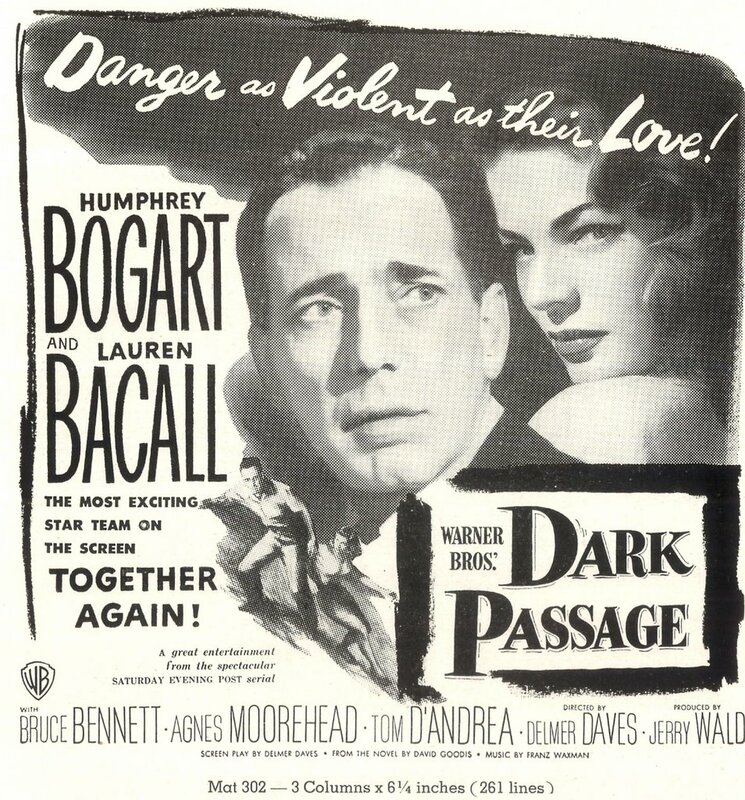 I've always been bemused by Warners' trailer for DARK PASSAGE -- a bit of film that reveals almost nothing whatever of the picture's famously complicated plot and focuses on the Bogart/Bacall chemistry. I can imagine audiences of the time discussing the trailer: "Well, what's the movie about? " "I dunno -- but Bogart and Baby are back!" Today, I regard Dark Passage mainly as the commitment that kept Agnes Moorehead from doing Macbeth with Orson Welles, leaving a pair of Shakespearean buskins that the woeful Jeannette Nolan could never hope to fill. As a kid, however, I always welcomed Dark Passage when it popped up (often) on TV. There was something oddly compelling about that long opening act, hearing Bogie's voice but never seeing his face, only a photo of "Vincent Parry" that, as I recall, looked more like Boris Karloff than the guy that any kid like me knew the voice belonged to. 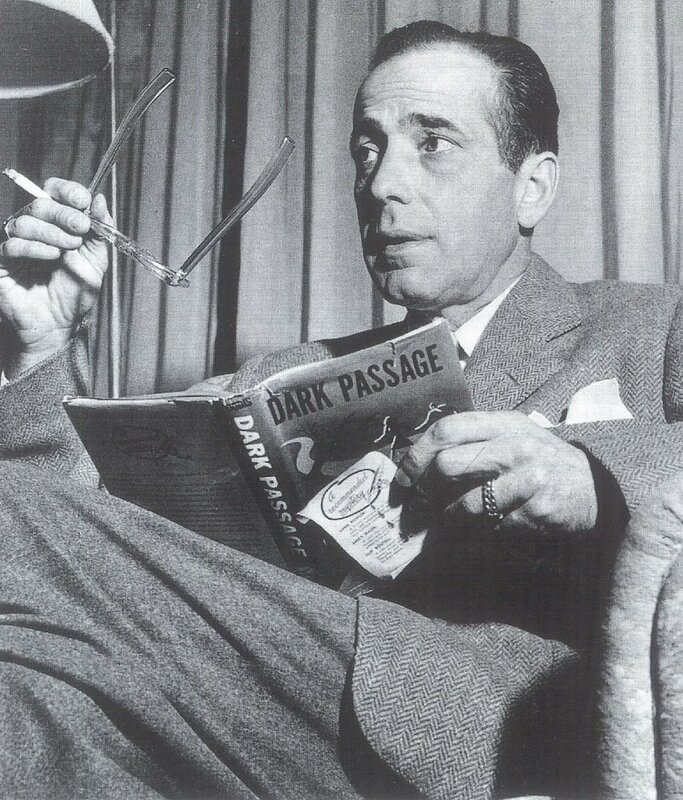 I have a fantasy about Dark Passage, too. You'll remember the scene after Parry's plastic surgery: The surgeon removes the bandages from the camera lens, the camera moves across the room to a mirror and, at long last, we get a closeup of our Bogie as he scrutinizes his "new" face, tentatively touching his chin and cheeks. My fantasy is that somewhere in the Warner Bros. vault there's an outtake of that scene, in which the star stares into the mirror for a moment, then snaps angrily, "You sonofab***h, you made me look like Humphrey Bogart!" 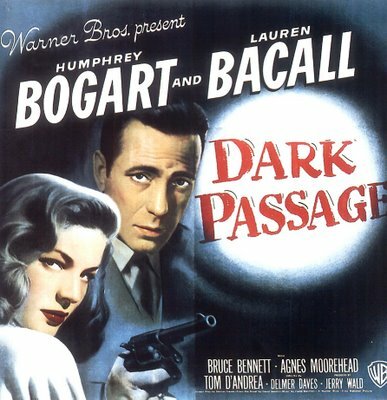 Dark Passage is good--maybe one too many "movie" contrivances to be a favorite, but very enjoyable. In a Lonely Place holds up much better. But outside The Caine Mutiny, never had the urge to sit through a Bogart war film. Excellent review, and as with many noirish films, it's the supporting players, even the small parts, that I like to look for today. Tom D'Andrea and Houseley Stevenson were so much fun to watch in the plastic-surgery episode, and Bruce Bennett always has such a mellifluous delivery. I always watch this if it's on TV. Actually, Miss Crabtree does ask Farina where he got the answers to the test, and the kids say in unison, "Bonedust." Great posting on DARK PASSAGE, by the way.